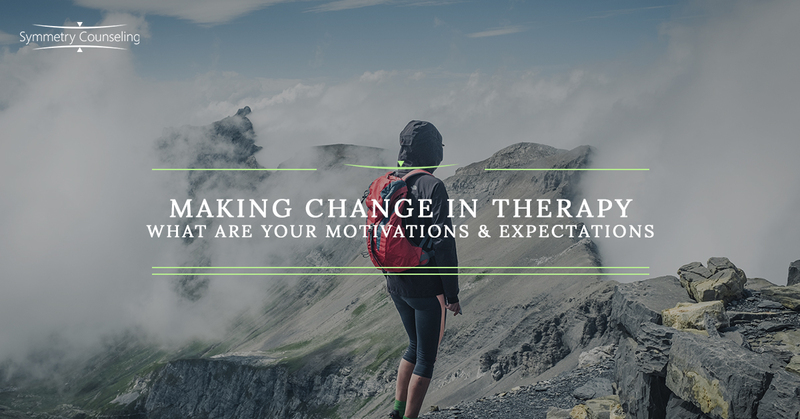 Making Change in Therapy: What Are Your Motivations and Expectations? What makes you decide that it is time to start seeing a therapist? There can be many reasons why a person or couple make this personal decision, but it is important to consider some of the motivating factors that can affect that decision as you begin this work. For instance, a previous therapeutic experience with a psychologist or counselor can color your perceptions. It can make starting the therapy process again feel overwhelming. It might leave you with preconceived ideas about what therapy should look like or how you should feel. You may feel that this is a path you have traveled before and you are afraid it could lead to the same destination. You may feel nervous that it could lead you to feel increasingly stuck in your current state of mind, be that anxiety, depression, or something else. Maybe you have developed doubts as to whether therapy could be successful for you. You may have had the opposite experience where your therapeutic relationship was rich and fulfilling and you developed new skills and insights about yourself. Some people can be afraid that they may not be able to recapture that same successful feeling that they had with a previous therapist. It is important to remember that all of the questions and concerns are incredibly valid to have and to feel. It is just as important to remember that these thoughts and feelings are incredibly worthwhile to share with your therapist. Building a relationship in therapy is more than just understanding symptoms and concerns. Therapy is building a relationship with your psychologist or counselor that is built on trust, and part of the trust is being open about what is motivating you to be in therapy and what you hope to achieve. The ultimate goal is knowing what you want to be different. One of my favorite questions when meeting with a new client during an initial counseling session is to have them tell me what did not work for them with a previous therapist. I can learn a lot about how to approach our therapeutic relationship by talking about a relationship that did not work. While many therapists have a distinct style and use specific techniques, we are also prone to change our approach if we feel as though we are not helping our clients make the change that they hope to achieve. By knowing what has not worked, I know what to avoid. I can also better learn what approach may be a better fit for your needs due to the process of elimination or personal preference. As more people seek mental health treatment for a variety of concerns, a new presenting issue has arisen. People are coming to therapy feeling unsure of what they want to work on, but state that their friends, coworkers, and/or family members are in therapy and have had such a great experience that they want to try it for themselves. I think it is brave to enter the therapeutic relationship with this blank slate approach. One of the things to consider is that, while you may not be bringing a specific concern, the results of therapy may end up looking and feeling different from someone who has had an issue or concern that has been weighing on them or making them feel stuck. While the result may look and feel different, however, the time spent working on yourself, as well as your emotional and mental state, during therapy is still extremely beneficial. You will be able to develop tools to help you through challenges that you have yet to encounter and as a result, be a stronger person for it. If you feel as though the time is right to make a change in your life, please contact Symmetry Counseling to be connected with one of our clinicians. You can send us an email through this online contact form, or give our team a call at 312-578-9990 to schedule a therapy consultation at one of our two Chicago locations.